Rambo: Can you tell me if Delmar Berry lives here? Q: Is 'First Blood' based on a book? Q: What did Rambo mean "They drew first blood"? Q: What is First Blood about? They drew first blood not me. They drew first blood. First Blood is simply one of the best films ever made. I think it transcends the action film genre and has stood the test of time. Stallone was immensely popular back in the 80's and if it is true that he hated the first cut of the film, then one can only say that he is lucky that he didn't get his wish to scrap the entire thing. John Rambo is first introduced to us as he is walking into a small town to look for a friend of his that he served in Vietnam with. Upon discovering that he contracted cancer coming back from the war, Rambo wanders aimlessly into town. He is greeted by a small town overzealous sheriff named Will Teasle, played wonderfully by Brian Denehy. He at first tells Rambo that he will help him out and give him a ride. When Rambo asks if he can find a good place to eat, Teasle directs him to a diner about 10 miles up the highway. Rambo asks if there is a law against him eating in the town, Teasle, says yea, me. This sets up the premise as Rambo begins walking back into town. Arrested for vagrancy, Rambo is taken to the local jail and we meet some of the local redneck officers, notably, a young David Caruso, who seems to be the only one who empathizes with Rambo. Finally, he escapes the jail and takes the entire small town sheriff department and the military on a hunt into the local "jungle." First Blood has strength of character. It has frenetic action scenes and every actor in the film is at the top of their game. Samuel Trautman, Rambo's mentor and former Colonel in the war, is played by Richard Crenna as a no nonsense but empathetic man. He knows Rambo has pushed back a little too hard but he understands where his plight comes from. He wants to avoid more bloodshed but at the same time he doesn't completely agree with how Rambo has been treated. He is obviously a law abiding citizen, but he knows that not all the laws were upheld when dealing with Rambo. Sylvester Stallone is RAMBO. There is no one else that could play him. Just like Harrison Ford embodies Indiana Jones and Bruce Willis is John McClane, Stallone is about as good as he has ever been here. He is quiet, he is strong and his physicality creates a character that many of us can empathize with and eventually root for. David Morell wrote a different character in his book but Stallone paints him more as a sympathetic character. He is correct in doing so. While Morell's vision is still present, this is more of Stallone's creation. Rambo is about as unique a character present in film history. 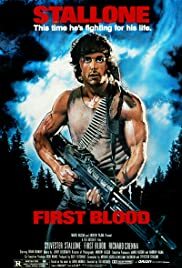 First Blood is a film released in 1982, but in my opinion it set a new standard for action film stars. I think James Bond was pretty much your standard action film star before that. He was smooth and debonair and nothing went wrong for him. 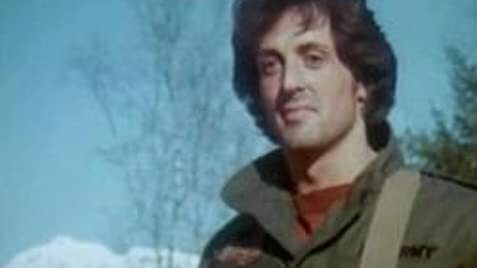 Rambo, at least in First Blood, is realistic. He bleeds, he cries, and he wears his emotion on his sleeve. This is someone that many of us could and can relate to. The sequels made him larger than life and that is fine, but this small film done by the Carolco guys is about as perfect a film as you can get. 195 of 241 people found this review helpful. Was this review helpful to you?